Today the morning greeted us with cloudy skies and some light rain. The sound of the raindrops pelting the car port roof told me what the day would be like and got me up to make coffee and sit by the window while Kitty had her breakfast. A quiet house and one of my favorite times of the day allows me to take a moment to relax and plan the adventures and menu for today. I had watched a Chilean friend's video blog where he was telling me about his plans and while I watched him, I heard his Mom ask him to tell me about her "Chilean Sopaipillas" I had inquired about some time ago. Naturally I was trying to get these right and went straight to the source since I didn't want fusion of any type to cha nge the preparation and I wasn't let down at all. Sopaipillas in Chile have been a comfort food staple since 1726 and can be sweet or salty. Served with mustard or "chancaca" which is a typical Bolivian, Peruvian and Chilean sweet sauce made of raw unrefined sugar crystallized with honey. It is often flavored with orange peel and is consumed on sopaipillas or picarones. You can easily use "piloncillo" for this plus I can use the Orange Marmalade I made some days ago. Picarones are also made with the same basic ingredients as the sopaipillas but are formed into a doughnut kind fritter and more popular in Peru where they are as traditional as you can get and mostly served along with "anticuchos" or meat on skewers. You might remember that New Mexico has a variation on the sopaipillas as well but have changed them to make them mostly a dessert item, pouring a piloncillo syrup over them and much loved in that part of the country. In Mexico we have "Bunuelos" which are made from flour, look like fried flour tortillas (I've been known to use these in a pinch) and sprinkled with a sugar / cinnamon mix or with a cinnamon infused syrup (while I add some Cardamom too). Today I am focusing on the Chilean version of "Sopaipillas" made from pumpkin, sweet potato or yam, giving them a lovely color and natural sweet flavor and while they too are fried, they are tender and moist and make a lovely snack with some hot chocolate, coffee or tea. If you like the South American traditions you might serve these with "Hierba Mate", a classic drink in most of the populations there and now available here in the US in Latin markets. A high caffeine tea, Mate is served with a metal straw from a shared hollow gourd. The straw is called a bombilla and has little holes to filter out the leaves. The straw is traditionally made of silver. I used to have one but wasn't able to "get into it" due to it's taste. But the rituals associated with the drinking of Mate appealed to me since drinking the yerba mate is considered to be more than just good for the body; it's also good for the soul. Drinking it can be a form of meditation or reflection - allowing the goodness to infuse into the body while stimulating and resting the mind. Those who share the mate join in a kind of bond of total acceptance and friendship. Generally the server will start a new infusion and then take the first drink. This is considered an act of kindness by the other people in the circle, because usually the first serving is considered the worst. 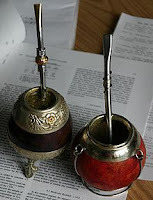 Mate is very much like coffee and tea, and is considered safe by the US Food and Drug Administration. In-vivo and in-vitro studies are showing that yerba mate exhibits significant cancer-fighting activity. In 1995, research at the University of Illinois found yerba mate to inhibit the proliferation of oral cancer cells, which is great but the legend appeals more to me: The Guarani people started drinking mate in the region that now includes Paraguay, southern Brazil, south-easthern Bolivia, north-east Argentina, and Uruguay. The Guaraní have a legend that says that the Goddesses of the Moon and the Cloud came to the Earth one day to visit it but they instead found a Yaguareté (a jaguar) that was going to attack them. An old man saved them, and, in compensation, the Goddesses gave the old man a new kind of plant from which he could prepare a "drink of friendship" which was "Matte". Seems we went off on a tangent thinking of all these rituals, but now we're back on track. All the Latin American countries share many similar dishes, with different names, but still have originals that never traveled past their individual countries and so set them apart. So much travel during the conquest years allowed for this exchange and as a result a varied and unique culinary diversity resulted. Chile has so much coastline that seafood dishes are always present, but then their agriculture is rich with the flavor of potatoes (over 200 variations of these) that g o back hundreds of years, plus the potato originated in the Americas. Since the sea occupies a major place in Chile, its so close by and makes fish and seafood high quality ingredients, you find raw dish dishes popular as well as many "casserole" type seafood dishes as well. Ceviche and it's variations are numerous, they still have Abalone (which is now almost gone in Mexico and miss a great deal) and their crab is exquisite. We all know Chilean Sea Bass, but the fusion made from European immigrants that settled in South America contributed to their cream sauces and wonderful wine species too. With the proximity of the pampas of Argentina and the rich grasses nearby, they also favor good meat and fire cooked dishes like the skewers and steaks that are also much loved. Depending if it's north, central or south area of the country there are variations to the dishes as well, but it's all good eats indeed. 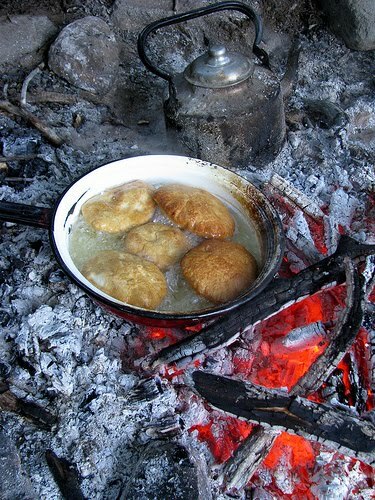 Chilean Sopaipillas.- From the Chiloe Archipelago comes this very traditional snack bread. Cook the pumpkin in water with a tsp of salt and cook until tender. Remove from the water (but reserve the liquid). In a bowl, sift the flour, baking powder and salt and mix gently, without beating, the pumpkin puree, butter and flour mixture so it becomes a soft dough. You can use some of the pumpkin cooking water if the dough is too dry. Take a quarter of dough and work on a flour covered space and roll out until it's about 1/8 inch thick and cut with a round cutting mold about 3 inch in diam. You could also use individual balls of dough and roll them out into circles instead if this is easier for you. Pinch the "tortillas" with a fork so they don't inflate as much and fry in hot oil until lightly golden. You can serve them as is or sprinkle with powdered sugar or a "piloncillo" and cinnamon syrup, your choice. Chilean Spicy Crab Cakes.- Here's a variation on the usual crab cake for you. 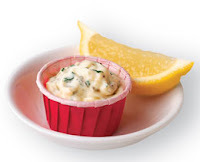 In a glass bowl, mix crab meat, onion, egg, lemon juice, pepper, paprika, aji paste, flour, and butter. Mix well. Form cakes into 2 inch diameter cakes and refrigerate for 1 hour. 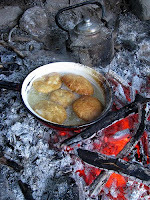 Coat cakes in bread crumbs and fry in hot oil until golden brown on both sides. Serve hot with a dollop of mayonnaise (or you can use my homemade Ranch Dressing or Tartar Sauce on top. Homemade Tartar Sauce.- This sauce taste better than any bottled you can get. Easy, fast and great on lots of things. Parmesan Clams.- Here's a super easy preparation that tastes wonderful. A quick dish too. Open the clams and separate the meat from the shells for easier eating if you like. Make sure there is no sand or dirt inside. Put the clams on a baking sheet in one single layer in their own shell. Pre-heat your oven to 400F. Into each clam shell put some drops of lemon or lime juice, a small piece of butter and some of the chosen tomato sauce, top off with some cheese. Place in the hot oven for about 4 min and serve at once. NOTE: You could also add some finely chopped onion, celery or bacon bits and could be topped with some seasoned bread crumbs and baked for the last minute of time in the oven. Drunken Pork Chops from Chile.- An easy preparation and wonderful flavors. Salt and pepper the pork chops well. In a large pan, put the oil and some of the butter to heat over med-high heat, once it hot add the pork chops and fry until cooked and tender. Remove to a serving platter to rest while you make the sauce. In the same pan, lower the heat to med-low and add the cream, the mustard, salt and pepper and the cognac. Allow to come to a boil for 1-2 min. Mix well and taste to adjust seasonings. Once the sauce has thickened (3-4 min, watch it while mixing it) turn off the heat and pour over the pork chops. Serve at once. Our little trip to Chile is now over and I leave you with some suggestions from this lovely land. I've got quite a few Chilean friends and we usually see them when there are big futbol matches and now with the World Cup coming up we're sure to have a good time with some great food to go along with it. It's still sprinkling here and the temperature is down to 47 degrees (Brrrr...) so I think I will do some baking to go along with the Drunken Pork Chops and take advantage of some Brandy I've got, will have to look around for that Brandy Cake with Raisins I posted around the holidays. I'll leave you now, hoping your day is lovely and that you will be inspired to try some Latin American dishes. Talk soon!